K100-forum.com » Technical, repair and troubleshooting » Frame, fairing and wheels » What lock core does the low seat lock use? I'm trying to help somebody low seat their bike. I have a low seat lock but it has no core. Is it the same lock core as any of the other locks? 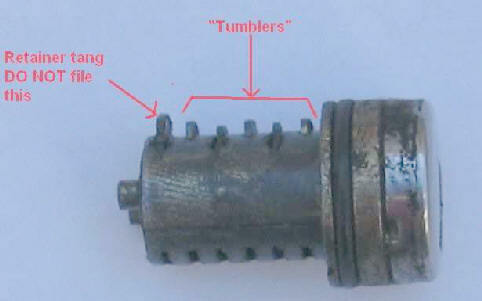 If you have the correct key it is possible to pull out the tumblers of other locks and try them. I believe that you just need to insert the key, go to the open position and depress the detent tab with a paper clip. The barrel should then pull out. I did some poking around in the fiche and then some experimentation and determined that the low seat lock uses the same lock core as the gas cap and 35L top case, the one with two metal nubs on the end.